Summary: We present a case of pleomorphic xanthoastrocytoma (PXA) in a patient with temporal lobe seizures. 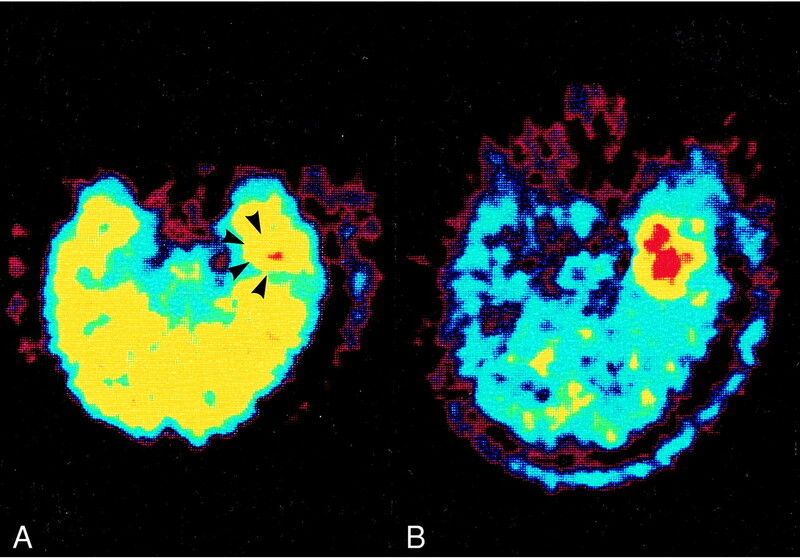 Imaging sequences included MR, and results of positron emission tomography (PET) with [18F]-fluorodeoxyglucose (FDG) and [11C]-methionine (Met) tracers revealed a hypermetabolic region equivalent or nearly equivalent to normal cerebral cortex, suggesting that the tumor might have malignant potential. Histopathologic findings indicated low-grade glioma. The mechanism for glucose hypermetabolic activity of PXA is not clear; however, the positive findings obtained from FDG-PET may not always indicate the degree of malignancy associated with PXA. Kepes et al (1) first described pleomorphic xanthoastrocytomas (PXA) in 1979 as a histologically distinct, benign supratentorial astrocytoma occurring in young patients. The CT and MR imaging findings among patients with PXA have already been reported (2–5). There, however, is only one case report describing the imaging findings of PXA obtained by use of positron emission tomography (PET) with the [18-F]-fluorodeoxyglucose (FDG) tracer (6). There are no published imaging findings of PXA obtained by use of PET with both FDG and [11C]-methionine (Met) tracers. Because FDG-PET can be used for tumor grading, and Met-PET can reveal invasive lesions, PET studies using both tracers are useful for predicting the prognosis of gliomas. A 22-year-old woman was first examined in 1990 for temporal lobe seizures. A post-contrast CT scan revealed a minimally enhancing cystic left temporal mass with calcification. Similar features were observed on post-contrast MR images. Fluid-attenuated inversion recovery (FLAIR) images revealed a cystic lesion with surrounding areas of high signal intensity (Fig 1). FLAIR indicated that the tumor extended to the anterior part of the temporal lobe, with partial invasion of the hippocampus and amygdala. PET was performed using both FDG and Met tracers. The PET scanner had spatial resolution of 4.5-mm full width at half maximum. The images, which were 10-minute scans, were obtained 50 minutes after IV administration of 185 MBq FDG for FDG-PET and 20 minutes after administration of 370MBq Met injection for Met-PET. Throughout the study, the patient's eyes and ears were patched, and the patient's head was immobilized by a head holder. The portion of the tumor with highest accumulation was selected as the region of interest. Tumor/normal ratio (TN) was defined as the ratio of radioisotope count in tumor to that in normal gray matter. FDG-PET revealed slight accumulation in the lesion, with a TN of 1.05 (Fig 2A), and there was no decreased FDG uptake area in the contralateral temporal lobe. On the other hand, on Met-PET images, accumulation was found over a wide area of the tumor in the left temporal lobe, with a TN being of 1.53 (Fig 2B). EEG with subdural electrodes, which was performed before the removal of tumor, revealed multifocal epileptogenic lesions, and functional brain mapping revealed that the Wernicke area was present in the posterior temporal region far from the lesion. The patient underwent anterior temporal lobectomy with gross total removal of the tumor. The superficial portion of the mass was partially adherent to the dura medially and the mass had cystic and xanthomatous solid components. 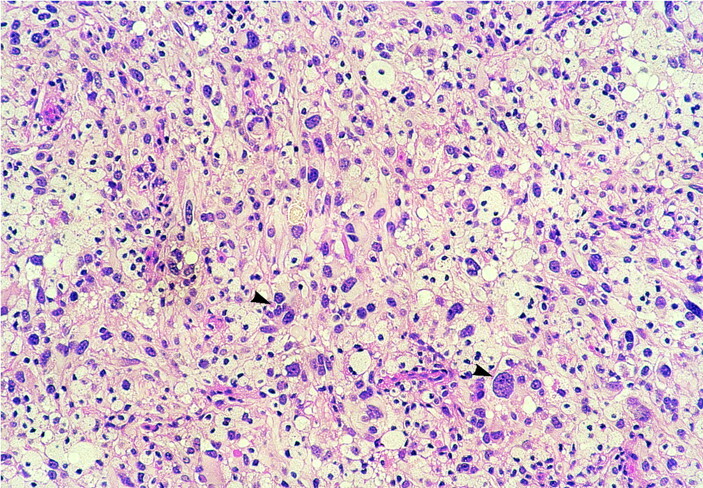 The resected neoplastic tissue was immunopositive for glial fibrillary acidic protein (GFAP), and histologic evaluation established the diagnosis of PXA (Fig 3). Cellular kinetic analysis using an antibody of Ki-67, which reacts with a nuclear antigen expressed by proliferating tumor cells, was performed to estimate the histologic malignancy of the glioma (7). The Ki-67 labeling index was calculated as the percentage of Ki-67 positive cells among at least 2000 cells on the specimen. This tumor had few Ki-67 positive cells, with a labeling index of 2.1, and exhibited no mitosis, suggesting low-grade glioma. Postoperative MR imaging revealed removal of the anterior part of the left temporal lobe. No residual tumor was visible. No temporal seizures occurred postoperatively, and no recurrent lesions have been noted during the follow-up period of 2 years 6 months. A, Axial postcontrast (Gd-DTPA) T1-weighted MR image shows a cystic lesion in the left temporal lobe. A poorly enhanced area is visualized at the anterior portion of the cyst (arrow head). B, Axial T2-weighted MR image shows a slightly hyperintense lesion around the cystic lesion appearing as areas of high signal intensity. C, FLAIR image shows a well-demarcated high-signal area around the cystic lesion. A, Axial FDG-PET image shows uptake of tracer in the lesion that is difficult to distinguish from cerebral cortex (arrow heads). The region of increased activity, which corresponds to the tumor, is in the left temporal lobe. B, Axial Met-PET image depicts high uptake of tracer in the lesion. The area of increased accumulation of Met is larger than that of FDG. PXA is considered to be a relatively benign variant of astrocytoma and to arise from the subpial astrocytes of the superficial cortex (1, 8). It is histologically characterized by pleomorphic, lipid-laden neoplastic cells with surrounding reticulin layers, and exhibits immunoperoxidase staining for GFAP. Despite its pleomorphic appearance, this type of supratentorial glioma has a more favorable prognosis than other tumors such as anaplastic astrocytoma and glioblastoma (2). Unlike malignant gliomas, PXA is not treated with radiotherapy after partial removal. Therefore, it is important to recognize and identify this type of glioma as a distinct entity; however, both recurrence and anaplastic transformation to more aggressive histologic properties have been described. If PXA has a high probability of recurrence, it may be necessary to perform total removal or radiotherapy. Uptake of Met is related to active carrier-mediated transport across the cell membrane and disruption of the blood brain barrier (BBB). Disruption of the BBB is not, however, necessary for increased Met uptake, because high uptake of Met is observed in low-grade gliomas in which the BBB is intact. Results of Met-PET are less strongly associated with tumor grade than those of FDG-PET. Some reports (9, 10) indicate that Met-PET is more effective in determining the area of tumor infiltration than is FDG-PET. In our case, Met-PET was useful for delineating the portion of normal brain tissue invaded by tumor. FDG-PET is capable of imaging the metabolism of brain tumors in vivo by using a variety of positron tracers. Previous studies have demonstrated the utility of FDG-PET among patients with brain tumors for assessment of tumor aggressiveness, effects of treatment (radiation necrosis, gliosis), tumor recurrence, and malignant dedifferentiation (7, 9). Bicik et al (6) reported use of FDG-PET to diagnose recurrent PXA. They mentioned that this lesion was clearly hypermetabolic for glucose with respect to white matter, and that a normalized increased glucose metabolic ratio indicated an aggressive lesion. They therefore proposed that FDG-PET could predict aggressive clinical behavior of PXA. In our case, FDG accumulation in the tumor was the same in degree as that in cortex, and FDG-PET indicated an aggressive tumor such as anaplastic astrocytoma. The clinical findings, however, did not reveal malignancy, because no evidence of recurrence was seen on follow-up MR images, and a low Ki-67 labeling index and lack of mitosis indicated a benign tumor. The Ki-67 labeling index is an indicator of a tumor's proliferative potential, which is generally believed to correlate positively with the TN determined by FDG-PET (7). In our case, there was a discrepancy between histologic findings and those of FDG-PET, so there is the possibility that the positive findings on FDG-PET do not always indicate the degree of malignancy associated with PXA that is revealed by clinical and histologic findings. On the other hand, considering the several reports of the malignant transformation of PXA (11, 12), even if histologic findings indicate benign tumor, follow-up by FDG-PET is mandatory in order to detect potentially malignant recurrence. FDG -PET findings may indicate that the grading of PXA has been underestimated. In our case, PET revealed uptake of both FDG and Met. The area of increased accumulation of Met was larger than that of FDG, and the TN of Met-PET was higher than that of FDG-PET. Concerning these discrepancies, autoradiographic studies (13) have suggested that FDG uptake may reflect the presence of inflammation such as the infiltration of macrophages, neurtrophils, and lymphocytes, and that Met uptake may be superior for estimating the presence of viable tumor cells. Clinical studies (14) have revealed that anaplasia is a factor associated with increased uptake of both tracers, but microscopic necrosis in anaplastic areas influences their uptake differently. As one reason for the discrepancies, we suggest that Met is superior to FDG for detection and delineation of brain tumors because of the high glucose metabolism in normal gray matter (14). Another reason may be that the accumulation of Met compared with FDG is revealed in all tumor cells regardless of their proliferative potential. Further examination is needed to confirm our suggestion concerning the results obtained from Met- and FDG-PET. Although there were some limitations to applying both tracers for distinguishing tumor from non-tumor, PET with both tracers appears to be clinically useful for the evaluation of PXA, as are MR images. ↵1 Address reprint requests to Naohiro Tsuyuguchi, M.D., Department of Neurosurgery, Osaka University Medical School, 1-4-3 Asahimachi, Abeno, Osaka, Japan 545-8586. Accepted after revision July 14, 2000.